Carl Schoonover ’06 merges science and aesthetics. 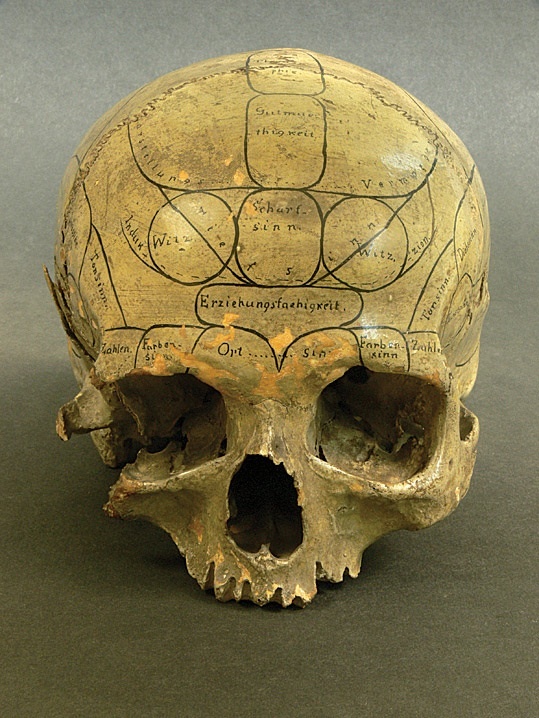 Phrenologists held that the specific site of bumps on the skull, as marked on this nineteenth-century specimen, helped indicate a subject’s cognitive or moral strengths and weaknesses by revealing the volume of brain area beneath each one. 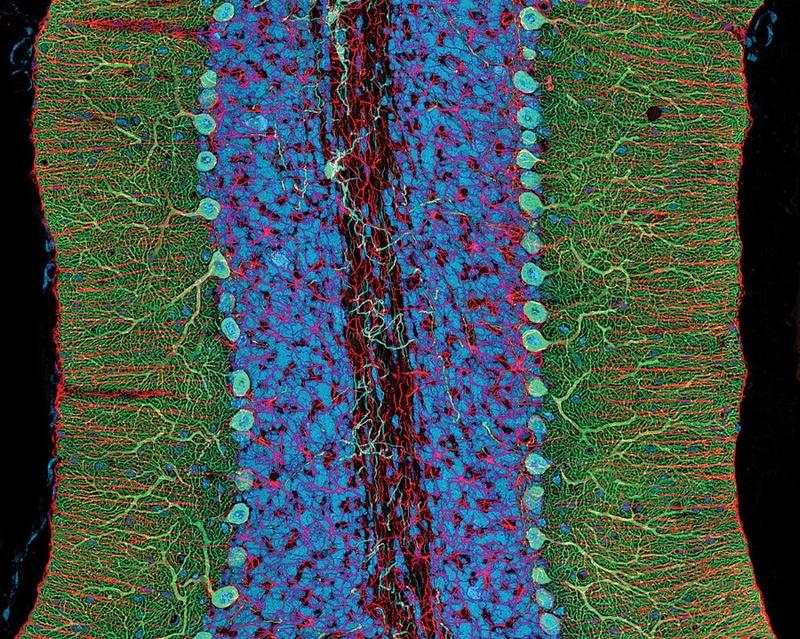 A photomicrograph showing different components of the rat cerebellum, including Purkinje neurons in green, glia (nonneuronal cells) in red, and cell nuclei in blue. Italian histologist and future Nobel laureate Camillo Golgi made this drawing of a dog’s olfactory bulb in 1875. The features were revealed by a revolutionary method for staining nerve tissue that today bears his name. 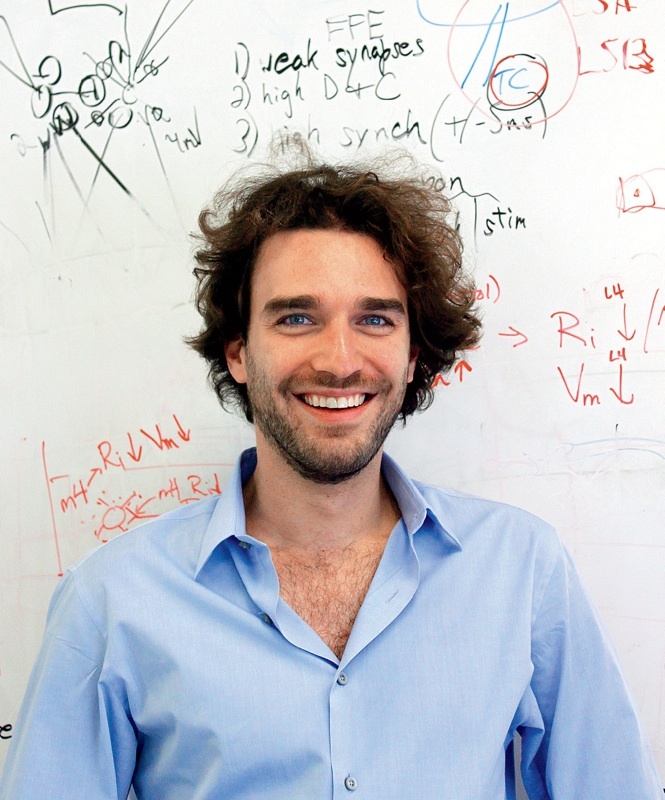 With flyaway hair and distinctive scarves—a fashion holdover from his childhood in France—Carl Schoonover ’06 cuts a stylish figure in the lab at Columbia’s doctoral program in neuroscience. But as a National Science Foundation-funded graduate student dedicated to researching brain circuits, he’s more inspired to talk about what goes on inside the head than what grows on top. The book balances the scientist’s obsession with detail and the artist’s appreciation for beauty, a reflection of Schoonover’s own multifaceted sensibilities: hands-on researcher, student of philosophy, writer, and lover of the arts. At Harvard, he organized concerts at the Signet Society and Lowell House—he used to play the saxophone and the violin—and was klappermeister for Lowell’s Russian bells. At Columbia, he works full-time in a lab, but has made time to cofound NeuWrite (a collaborative forum for scientists and writers), attend music concerts weekly, and host a radio show on classical and contemporary music that occasionally discusses music’s relationship to the brain and counts, among its past guests, neurologist Oliver Sacks and Daniel Levitin, author of This Is Your Brain on Music. Schoonover’s ability to pursue, in tandem, what are sometimes seen as opposed interests made him stand out even at Harvard, his friends and colleagues say. “Carl proposes these fairly ambitious projects that look like they’re straddling fields in a way that doesn’t seem realistic,” says his mentor, Joshua Sanes. “They seem like a prayer for disaster, but he’s pulled off every one of them.” That gift, combined with a highly adaptable intellect, a bottomless well of enthusiasm, and what a former lab mate described as “an unusual lack of self-consciousness” may help explain why he seems to be extremely good at so many things. Throughout college, Schoonover balanced his interests in philosophy and biology, first at Columbia, where he was so intrigued by lab work that he approached a research director, said, “I am very eager and completely ignorant,” and landed a position washing dishes. That slowly evolved into actual research and three summers of working on neuroscience projects. Today, in Randy M. Bruno’s lab at Columbia, Schoonover studies how the physical connections between neurons affect the flow of information in the brain. His area of specialization is the rat barrel cortex, where movements from the whiskers are registered: How does a neuronal circuit translate the movement of individual whiskers into a representation of the rat’s environment? In pursuit of an answer, Schoonover divides his time between live rats and the microscope, where he is working on a novel technique for identifying synapses, the connections between neurons. “It’s a fun surgery,” he says of the delicate two-hour operation he performs to insert electrodes that record neuronal activity in an anesthetized rat’s brain. A dentist drill is used to thin down the skull, then a square half a millimeter on the side is cut into the now paper-thin bone. Once the bone is removed, Schoonover peels away the dura mater, the one-tenth-of-a-millimeter-thick membrane surrounding the brain—all without touching or damaging the soft tissue underneath. Schoonover is intent on explaining science; Portraits of the Mind was partly born from frustration with how inadequately scientific techniques—and science in general—are presented to the general public. The media often focus too much on results over process, he believes: “They get this final packaged story that has a weird, misleading ring of truth along the lines of ‘This is how things are,’ instead of, ‘We conclude this, based on circumstantial evidence that relies on these techniques that are more or less reliable.’ That’s how scientists actually communicate.” NeuWrite, the forum he co-founded at Columbia late in 2007 with biology department chair Stuart Firestein and then-graduate student Clay Lacefield, was set up to bring scientists and writers together to foster more accurate and enticing narratives. Portraits of the Mind was workshopped there, and several other book projects by members are pending, as well as a stream of mainstream science articles, including one on optogenetics coauthored by Schoonover published in the New York Times science section in May. The long-term plan is to scale up NeuWrite, Schoonover adds; a second, parallel, New York City-wide group is set to launch this fall and there is talk of starting a Boston counterpart.